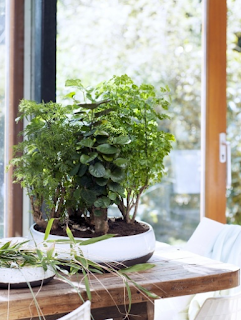 Check out The Joy of Plants for further information and a whole load of fun and inspiration. Yesterday I spent a good hour sawing the branches off our Christmas tree, just to get it out of the front door. We'd got over excited, you see. And bought a massive one. Consequently, with the tree now hacked to pieces and ready for composting, the living room feels bare, lifeless. Of a much smaller stature than that pine monster, obviously. These boys cheer a space right up AND they are air purifying. Which means you can have a glass of vino while they do the January detoxing for you. Probably. 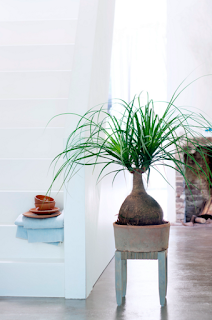 There are four main types of indoor tree; Beaucarnea, Dracaena, Polyscias and Pachira. They are all considered to be 'greenery on a trunk', which is where they store water making them very easy to care for. Ideal. The beaucarnea is often referred to as the ponytail palm or the elephant's foot. It is in fact neither a palm nor an elephant's foot (despite looking a tad like both due to it's thick trunk and splaying, thin leaves), but part of the asparagus family. 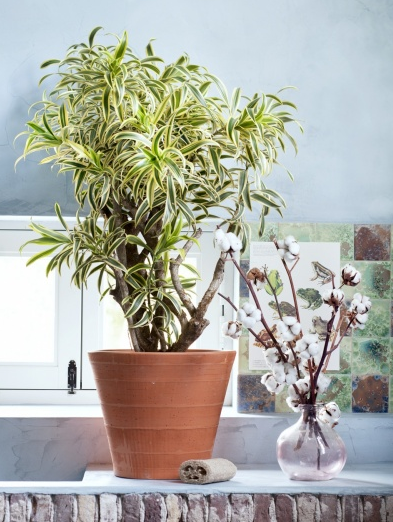 Keep him in a nice light spot out of direct sunlight and let the soil go dry between waterings. The leaves of this beauty come in a variety of shapes and colours; green, yellow and gold leaves with tones of pink and red in certain areas. Keep the dracaena away from cold and draughts and preferably in a nice warm pool of light. Only water once the soil has dried up. The polyscias are the most 'tree looking' of the indoor trees, as they grow upwards, with leaves filling out along the length of the trunk. 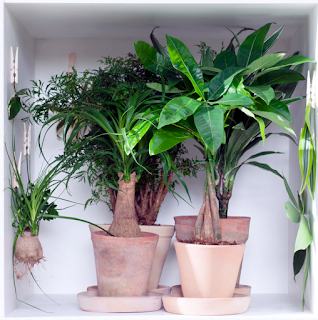 They prefer shade over direct sunlight, and like to be watered little and often so that their soil remains moist. A perfect gift for anyone in January - the pachira is considered in China to bring fortune and happiness to the home and is often called the money tree. 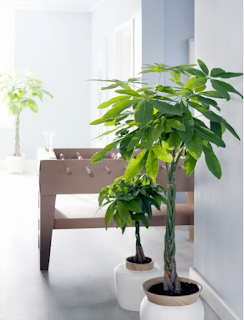 Also referred to as the Malabar chestnut, it's a real good looking tree with it's lovely, fast-growing, hand-like leaves. Keep out of full sunlight, keep the soil damp and give the leaves a good spray every so often.